Did the ancient Egyptians leave their mark all over the planet Mars? Compare numerous artifacts, and see the evidence for yourself. 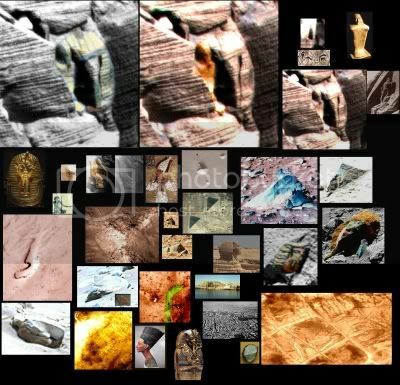 Several artificially suggestive features on Mars bear a similarity to the artifacts of Ancient Egypt. Pyramids, sphynxes, pharoahs, the asp, the hieroglyphic eye, the unique headware of ancient Egyptians such as that which is depicted on Nefertiti and Osirus are iconic images of Ancient Egypt. The tradition of carving a human image in relief on the ancient Egyptian sarcophagus is also well-known. The famous sphynx, half-man and half-lion, and has been compared to the Cydonia face which many believe depicts the left half of a human face and the right half of a lion face. The ram also played a significant role in ancient Egypt, and was frequently depicted in their artistry. The Egyptian god Amun, was freqently shown as a human being with a ram's head, and many ram statues and other artifacts were produced in honor of Amun, such as the rows of ram-headed sphinxes leading to Amun's temple at Luxor-Karnak. Lesser known, but also a part of ancient Egypt were the cave tombs located in the cliff faces such as the ones located at the Valley of the Kings and the Valley of the Queens. Those entrances tended to be simple arched openings in the rock face. This tradition though, was not limited to Egypt, but occurred at many places around the world, such as the more sophisticated cliff cave entrances located at nearby Amasya, Turkey shown in this video as a comparison. Some of the cave tombs in Ancient Egypt were said to have an overhead view of the hieroglyphic symbol for their Goddess, Nun, engraved into the ground below. (This varies of course from the Hebrew symbol for Nun which is shown in the video, but is interesting nevertheless, in that the Hebrews were connected to the Egyptians through there long period of slavery under Egyptian masters). It is an interesting coincidence that our biggest Martian meteorite find, a rain of 40 rocks weighing 88 pounds in total, fell on Nahkla Egypt in 1911.